Journey's end begins back in 1918, with Charles and Fred Norman returning from the battlefields of France and setting up business from their garden shed as Kent Plating and Enamelling Co. Progressing from frame making and finishing, the enterprise started making its own bicycles in the 1920s, and naturally drifted towards producing autocycles and light motorcycles with their first machines appearing on the market in 1939. Confusingly, they christened their first autocycle 'Motobyke', but this was before the general description for the new breed of pedal assisted, small capacity machines became adopted from the James title. 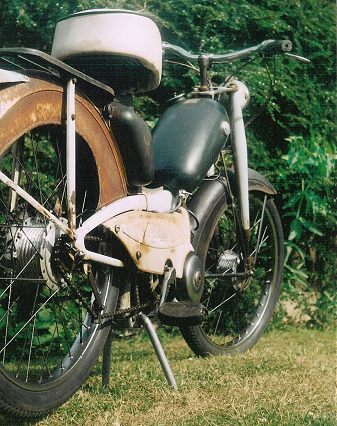 By 1940, the new Villiers JDL motor had succeeded the original Junior and Norman added variants of the standard Motobyke: a Carrier model, and a de Luxe with Webb blade girder sprung forks. As the EMI plant at Hayes became turned over to military requirements, Norman took in work building out the last of the Rudge Autocycles in 1940, before closing their own production later in the year. Manufacturing resumed in 1946, by picking up much the same models, up to the close of 1949, when their Villiers 2F powered "Model C" autocycle and new motor cycle models appeared. Ownership of the company was sold to the Tube Investments group in 1953 and Norman Cycles became part of the British Cycle Corporation, though Charles and Fred continued to direct the business. The Earls Court Motor Cycle Show of November 1955 heralded the arrival of Norman's new 'Nippy' moped, which went on sale the following season, while the Model C autocycle continued until its final listing in May 1957, making Norman the only manufacturer simultaneously producing autocycles and mopeds. Having reached our final destination at the Norman Nippy moped, we really need to grasp exactly which Nippy we're talking about here, since there were actually five Nippy model numbers and six different machines! Confused? It's not surprising, but this basic identification guide will help to sort them out. Rigid Capri frame, Capri forks, steel headlamp nacelle, Sachs 2-speed engine. Listed November 1955 to January 1957. Plunger Capri frame, Capri forks, steel headlamp nacelle, continental valenced mudguards, Sachs 2-speed engine. Listed November 1956 to September 1959. Plunger Capri frame, Lido forks, plastic Lido headlamp nacelle adopted from now on, Lido mudguards, Villiers 3K 2-speed engine. Listed November 1958 to October 1959. 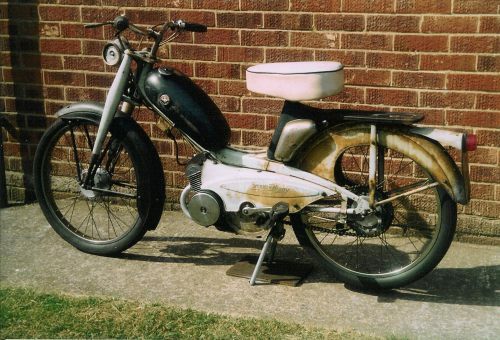 Lido style frame with integral petrol tank, Lido forks, swing-arm disabled by rigid tube struts in place of suspension units, Lido mudguards, Mi-Val automatic engine. Listed December 1959 to November 1961. Lido style frame with integral petrol tank, Lido forks, swing-arm rear suspension, Lido mudguards. Villiers 3K 2-speed engine. Listed December 1959 to May 1962. Motobécane rigid frame, telescopic forks, Mobylette automatic engine. Listed September 1961 to July 1963. Early Nippy models were marketed under licence from the Achilles company in Germany, versions of which were also sold by Achilles as the Capri, and under further licensed brands of Germaan, Union, AMI and others. 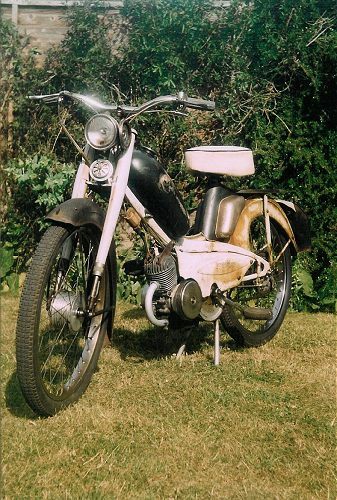 When Achilles ceased trading in 1957, Norman acquired the tooling and rights, and continued to develop their own versions of the Nippy and Lido mopeds. As the Achilles derivatives became discontinued, the Nippy Mk5 and Lido Mk3 introduced new Motobécane-based variants. Though the Mk5 is basically a Raleigh RM4 in different trim, it is worthwhile to note features on this very original and unrestored example. The dark grey is common to the Raleigh, but where the RM4 featured a cream livery, the Norman Mk5 is finished in a distinctive 'Ice Blue'. While the 'Super-comfort' saddle is also standard equipment to the RM4, the Raleigh version has a contrasting red top, where the Norman cover sports a special 'Ice Blue' top to match its own paintwork. 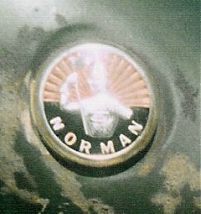 The Perspex tank badges were unique to these last Norman mopeds, and the sidepanel transfers with Mark 5 model reference - it'd be unlikely that these could ever be replaced. The Raleigh RM4 was branded as top of the model range, fitted with Luxor headlamp and integral Huret speedo. Early RM4 models started with handlebars clamped to the top yoke, and Mobylette handlebar furniture. The middle-branded Norman features a Lucas type headlamp (with no speedo) as carried over from RM1 & RM2 models, stem mounted handlebars, and Raleigh/Amal pattern handlebar fittings. Base model of this family was the Phillips Panda Mk3, painted in flashing 'Royal Carmine Red'. Our test machine may not sparkle like a new pin, but many will appreciate the mellowness of such an original and unrestored example. Registered in July of 1962, 43 years old and everything is very standard and correct. The Mk5 is dead easy to start: lever tap on the Lido fuel tank that Raleigh cleverly adapted to the frame, trigger choke on the left handgrip, forward decompress with the Amal twistgrip, then simply turn back the throttle when the engine turns. The motor fires up straight away, then just flick the choke a couple more times until it runs happy without it. Acceleration from the 1.4bhp motor with 6:1 compression and 10mm Gurtner carb isn't something you have to brace yourself for; the Norman chugs slowly away until you appreciate it might be best to give a bit of pedal assistance or you could be there all day! It's not so bad once under way, relentlessly plodding along, labouring steadily up light inclines, and gives the confidence that it'll always achieve its destination. The telescopic forks are sprung fairly firmly so you do bounce about a bit, but they certainly smooth out the jolts you feel from a solid cycle fork and give a far better ride than the famous RM6 Runabout. 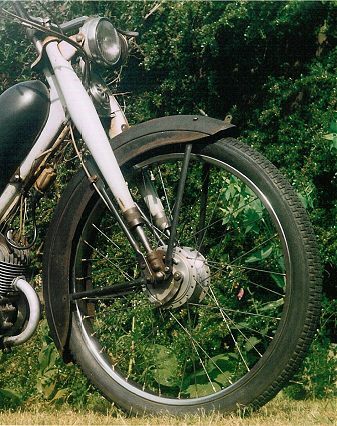 The 90mm full-width Prior alloy hubs are a very generous specification for a commuter moped of such stunted capability, so braking is particularly good. When it comes to performance, there's a lot of busy growling coming from the motor at full throttle, but it's all bluster, four-stroking and vibration. Motobécane typically listed similar 1.4bhp automatic models at 25 to 30mph, and the Norman Nippy Mk5 falls right in with these claims at a best paced speed of 28mph downhill with tailwind. On the flat it returns around 25mph according to conditions, while handling isn't really of much concern for a vehicle of such sedentary performance. That Raleigh 'Super-comfort' mattress saddle really is super-comfortable, it may look a bit large and disproportionate for a moped, but appreciably smooths out the ride of the rigid tail, and is probably about the most comfortable period moped seat you're likely to find. The 18W Novi 6V generator feeds the 3W rear and 15W Lucas headlamp, to deliver a comforting warm glow, but little in the way of practical illumination - pretty typical of the time! Quality of general cycle fittings is very good: a pressed steel rack,two toolboxes, generous sidepanels and amply valenced mudguards. Handling manners and comfort of ride are very adequate for the performance and braking is particularly good. The lazy 1.4bhp Motobécane motor is utterly dependable and is hard to imagine how it could ever be worn out, while the limited performance simply doesn't justify the fitting of a speedometer! The Nippy Mk5 is pleasantly styled, generously appointed, and quite reasonably priced at exactly £60 for the 1962 season. A thoroughly practical commuter moped, reliable as the day is long - but with little chance of imparting many thrills to the rider! If you sawed it in half, it would have the word "commuter" written through its middle like a stick of rock. It's an easy machine to ride, predictable, safe, slow, but rather - dull! When Charles and Fred Norman retired, the Ashford factory closed its doors for the last time on 30th August 1961. 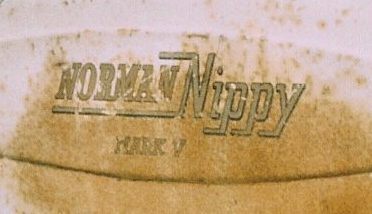 Now, sharp-eyed and attentive readers might have noted a seeming anomaly with dates of the Nippy Mk5: it wasn't even announced till the next month following closure of the Norman factory. That's right! The Nippy Mk5 was merely a market branded exercise assembled at Raleigh in Nottingham, in fact, the last of the Nippy Mk4 machines were also built out in Nottingham following closure of the Norman works. Of the three 'family' machines, the Raleigh RM4 sold well as the top branded and best appointed model. 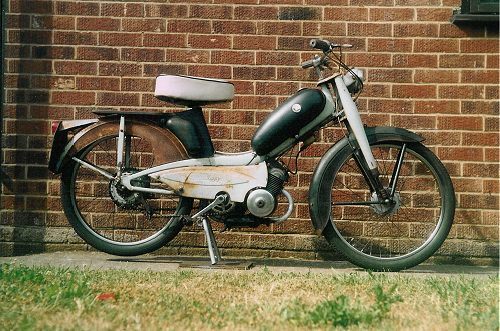 The Phillips Panda Mk3 also proved very popular in its position as economy model. The Nippy Mk5 however,was lost in the middle ground and sales were rather disappointing. It soldiered on long enough to be included in Raleigh Moped Service Memorandum no 7 dated 1st April 1963, advising introduction of the new 1.7bhp motor from frame number 1N3667. It was still being listed in the Cycling & Mopeds guide for July, but appears to have been withdrawn at the end of the season. Just two years after closure of the Ashford castle, the Norman badge had reached its Journeys End. The Phillips brand followed Norman into oblivion before the 1964 sales season got started, and Raleigh de-listed their own RM4 by February - to be succeeded by the new RM8. Next - Did our princess prick her thumb in the rose bower? She awakens on the first day of the New Year in 1966 - it'll be Super to go Touring with Rhoda again!